Let’s get it out of the way up front: You’re a fool if you don’t include Google Analytics in your toolkit as a way to track your website’s traffic. The advantages are almost too numerous to list. A de facto industry standard, its reports are often taken as gospel by advertisers. Google Analytics also has robust multi-user features (so your Web developer can also keep an eye on traffic, for example), and it syncs well with AdWords, making it easy to see whether your paid ads elsewhere on the Web are getting results. But maybe you just don’t like Google. Maybe you don’t like the famously complicated interface that Google Analytics features. Or maybe you just want to double up on tracking tools so you can ensure Google is giving you accurate information. Clicky is a well-designed and comprehensive tracking tool. It tracks a large and robust amount of information by default, and its intutitive dashboard provides a snapshot of hourly traffic, top referrers, top pages viewed, and meta information like the total time spent on the site and bounce rate. It's easy to navigate, with just about everything you need available at a glance on a single page. The “Spy” button is a particularly engaging (if not entirely practical) way to see what users are doing on your site in real time, offering up a scrolling list of the pages they’re visiting and a world map plotting their locations. However, digging deeper into the tool can often send you scrambling to the Help system for a better understanding. Clicky has comprehensive features but conflicts with WordPress’ tracking tools. Clicky’s social media tracking is weak. 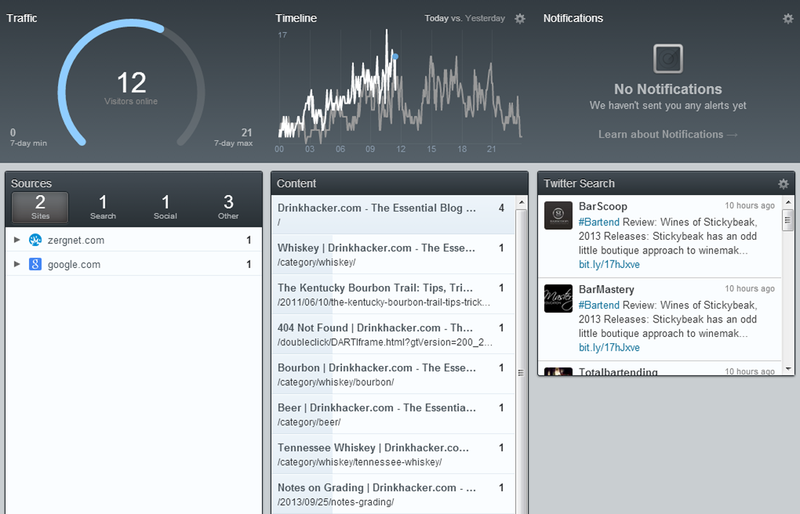 You can track specific Twitter searches, but only with a premium account. Multiple users are supported, including up to 10 on the free version. Results seemed perfectly accurate, with less than 2 percent variation against Google Analytics. WordPress users should take note that Clicky isn’t compatible with Jetpack. If you use the WordPress plug-in for Clicky, it replaces Jetpack’s 48-hour tracking information (as seen in the WordPress admin bar) and suspends WordPress’s internal tracking system. You’ll have to disable the Clicky plug-in to get the old stats back. No matter what CMS you have, though, copious plug-ins are available to integrate Clicky into a huge array of blog publishing and other CMS tools. Clicky is free for up to 3,000 page views/day for an unlimited amount of time. If you go over that traffic level then you have to upgrade to a premium account for $10 to $20 per month, depending on your total page views. Overall I found Clicky to be a worthy alternative to Google with plenty of bells and whistles to dig into, but its difficulties in playing nice with Wordpress’s built-in tracking tools—which I didn’t want to give up—made it tough for me to swallow. Like Clicky, GoSquared gives you an at-a-glance look at everything important happening on your website, including by-the-hour traffic patterns, historical comparisons, referrers, busiest pages, and more. You can look at this information from a trend perspective or analyze it in real-time as it arrives. The real-time view shows how many visitors are currently on the site and what they’re looking at, and even offers a sidebar displaying recent tweets about your brand. Information can be organized to your liking using the site’s widget-based design. Go Squared provides a daily digest of your website data so you can stay on top of traffic even during crunch times. Setup is easy, with plugins available for WordPress, Joomla, Magento, and Drupal, and accuracy appears spot on—I got virtually identical statistics to Google Analytics’ numbers. But one thing I really enjoyed about GoSquared is the daily email it sends you by default. If you find yourself too busy (or forgetful) to regularly check your Web analytics, this handy digest report keeps everything top of mind, including not just information about your daily traffic but also where it’s coming from and what your top search terms are. GoSquared is free for 14 days, then requires upgrade. Plans range from $9 per month for 150,000 page views (monthly) over three sites, to $99 a month for 2.5 million views over 20 sites. The number of additional users you can add rises with each plan tier (at the $9 level, the service is available for only one user). I really enjoyed using GoSquared and recommend it, but higher-traffic sites will want to be wary about the price ratcheting up. 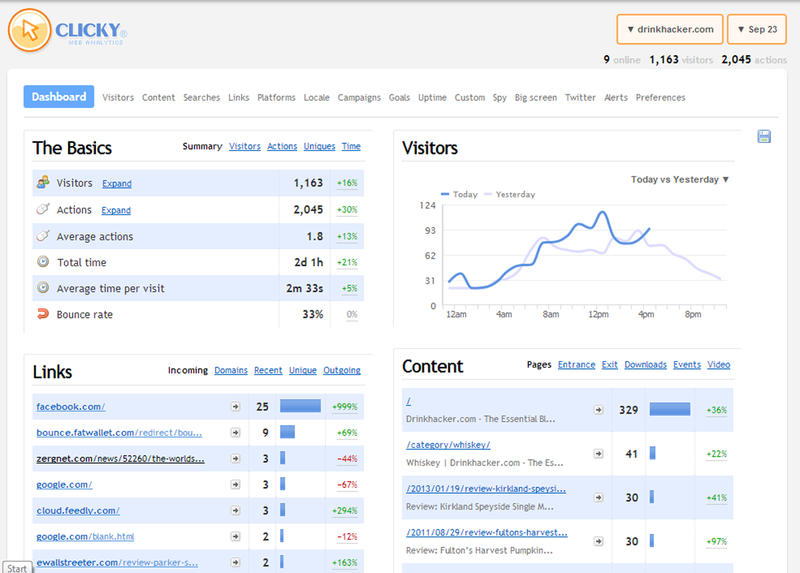 Woopra is focused foremost on real-time analytics. Its dashboard looks like something out of the Pentagon, featuring a world map with hotspots indicating your visitors’ locations, top pages visited, and a nicely designed traffic sources infographic. Click over to the Visitors panel and you can see exactly what each visitor’s clickthrough pattern has been throughout their visit—and you can see what they’re reading at that very moment. The tool provides a lot of power with minimal effort on your part. 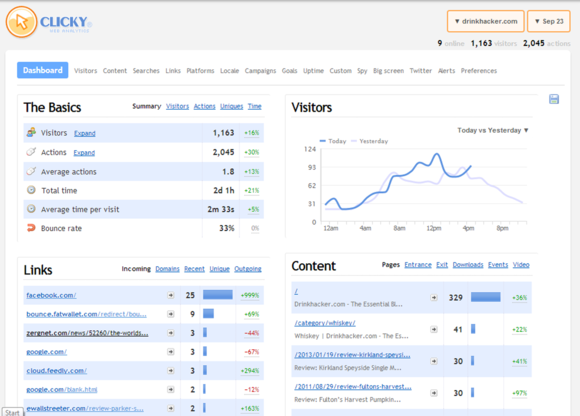 Woopra’s sales analysis features make it a great option for ecommerce sites. Digging into Woopra beyond the preconfigured basics can get a little daunting, but users who want to set up sales funnel analysis or detailed “retention analysis” reports will find them here. If you run an ecommerce site, this probably provides a load of additional value that a mere content site doesn’t need, such as the ability to see what products individual users have considered, how much they’ve bought from you, and even whether they have returned merchandise. You may need professional help configuring this, as evidenced by the “Send instructions to my engineer” button that’s displayed during setup. For more simple needs, a WordPress plug-in to support Woopra exists, but it isn’t promoted on the Woopra website. One issue with the service: Woopra tallied considerably more traffic during my test run than other services (and Google Analytics), to the point where I typically saw numbers 23 percent higher on Woopra than on all the other services, which all tallied traffic at the same level. That’s a big discrepancy, which Woopra ultimately attributed to an overly aggressive timeout setting for idle users. A highly restricted free version of the service is available (30,000 actions—or page views—per month), so most small businesses will have to upgrade in order to handle the traffic and get access to features like multiple users and the more advanced reporting. That can get pricey, starting at $80 per month (400,000 actions) and heading up to $1,200 per month (10 million actions). Either way, you get 30 days of Woopra for free. 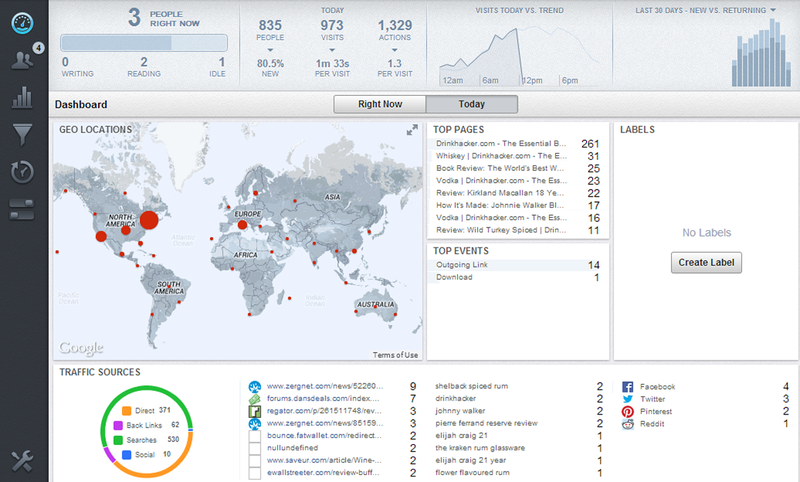 When it comes to real-time tracking, Woopra is second to none. That said, you’ll need to be ready to invest if this kind of information is critical to you. 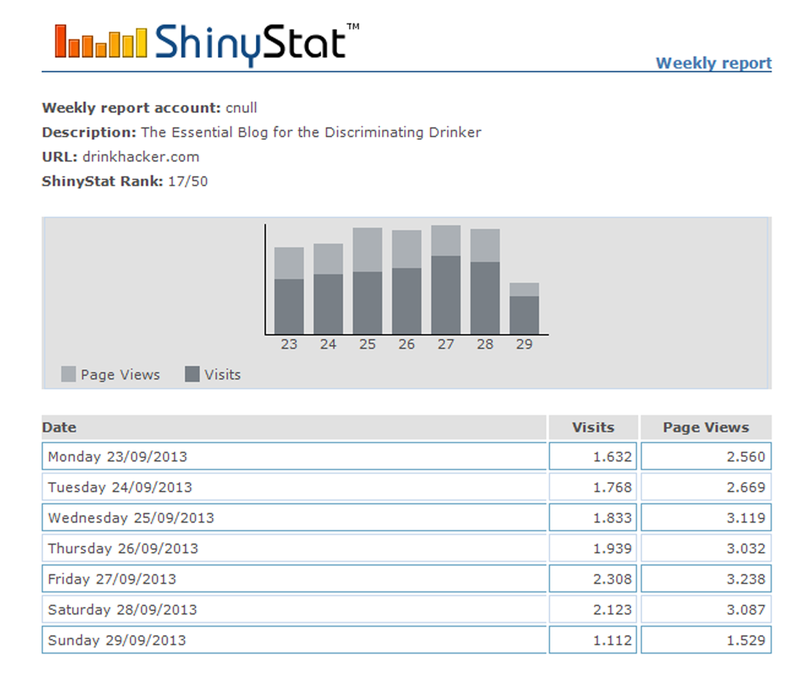 ShinyStat at first appears to be yet another embedded counter widget that simply counts page views (so very ’90s), but dig into this system and you’ll find a whole lot more to it, including daily and hourly traffic stats, user demographics, and referrers. With a paid Pro or Business account you can access the most popular pages and set up conversion tracking. There’s even a video referrer system available. Shiny Stat’s simple interface belies it’s robust reporting tools. With no plug-ins available, you’ll need to modify your website’s HTML to embed the tracking code on every page, but this isn’t complex. In fact, I was more concerned with some serious security no-no’s on the site, like the fact that after you register, your password is sent to you in an email in cleartext. Speaking of emails, ShinyStat also sends you a weekly report by default. It’s simple but helpful and surprisingly accurate, underreporting traffic by only about 3 percent vs. Google Analytics. Outside of the free version, the service is offered for a yearly fee, from €88 (25,000 page views) for the Pro version to €2600 (5 million page views) for the Business version. However, I don’t see much value in the upgrades. The free version of ShinyStat offers enough to make it a worthwhile secondary tracking tool—if you don’t mind the counter/advertisement you’ll have to embed on your site in order to use it.